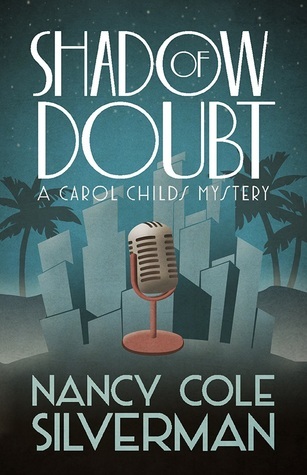 Talk radio has never been more exciting thanks to Nancy Cole Silverman and her first Carol Childs mystery, Shadow of Doubt. An early morning knock on her door brings a huge news story and a dangerous string of events across Carol Childs’ path. The visitor is Carol’s neighbor, Sam, who has just learned that her aunt, Pepper, is dead. Sam is somewhat less than brokenhearted, but Carol isn’t too surprised. She’s heard plenty of stories about the infamous Hollywood talent agent. But as events unfold along a dark road, it becomes clear that Pepper’s death is suspicious, meaning that those comments about being happy that her aunt is dead are coming back to bite Same. Now it’s up to Carol to figure out a way to prove that her neighbor is innocent. Shadow of Doubt is a page-turning puzzler. Carol balances motherhood, a steamy romance with FBI agent Eric, a precocious boss, and the repeated (and rather unsettling) run-ins with a shadowy psychic named Misty Dawn. (Who I secretly adore!) And she manages it all with admirable dexterity. Nancy Cole Silverman’s plot comes full circle and creates the perfect segue into the next Carol Childs mystery – for which I’m rather impatient!